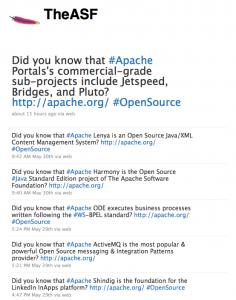 Over memorial day weekend, I noticed that the Apache Software Foundation is having a little fun with marketing over Twitter. I’m a fan of their “Did you know…” series of posts as of late. I mean, I had no idea Apache Shindig is the foundation for the LinkedIn InApps platform… and I’m sure the folks at LinkedIn wouldn’t have told me in a straightforward fashion either. I mean no offense to the folks at LinkedIn and other companies that use open source software, but they generally don’t do the best job advertising the open source technology they use. Sure, some companies are better than others but my point is that the burden of marketing seems to fall on the open source projects themselves. The problem with that is that open source developers are generally terrible at marketing (well, mostly apathetic). And I can guarantee you that if no one talks about your project or can find it, no one will be really using it even though it may be a great piece of work. At Eclipse.org, I know this has been a bit of problem given just the diversity of projects and from people who have spoken to me. The Eclipse Foundation has done a good job when it comes to case studies on people building upon the Eclipse platform, but what else can it do for projects? From my own experience in supporting people who use Eclipse technology in the field… it’s quite amazing where you see Eclipse technology turn up… from ski lifts to banks to rail way systems. I don’t think many people understand the breadth of places that Eclipse technology shows up. Just a couple days ago I learned that Xtext was helping the automotive folks at AUTOSAR. If the burden of marketing falls to open source projects themselves, what can you do to convince people to “sell” their project a bit? Should we suggest webinars as something people do as part of the release review process at Eclipse? Should a book be required as part of a graduation review at Eclipse (ok, maybe that’s a bit much but I’m still waiting on my Xtext book)?